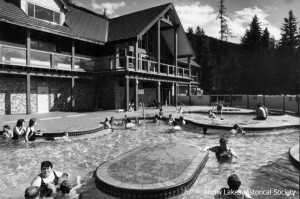 Located in the pristine mountains bordering Upper Arrow Lakes, Halcyon Hot Springs had a colourful history full of hope, healing aspirations and relaxation. First utilized by native peoples, it was fought over, made peace over, then bought by a pioneering individual and built up from humble beginnings to grandeur. 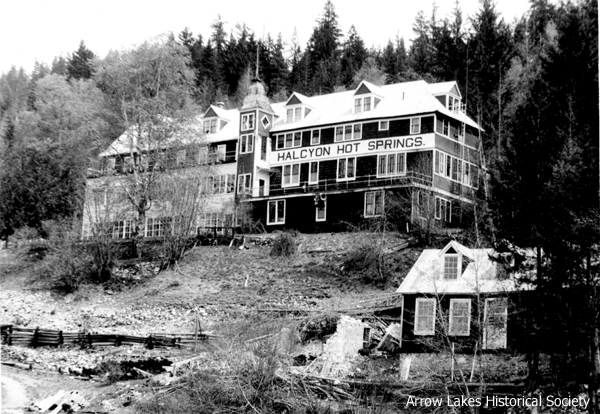 A health retreat, a party place, Halcyon Hot Springs Hotel was a popular destination from the 1890s to the middle 1950s. 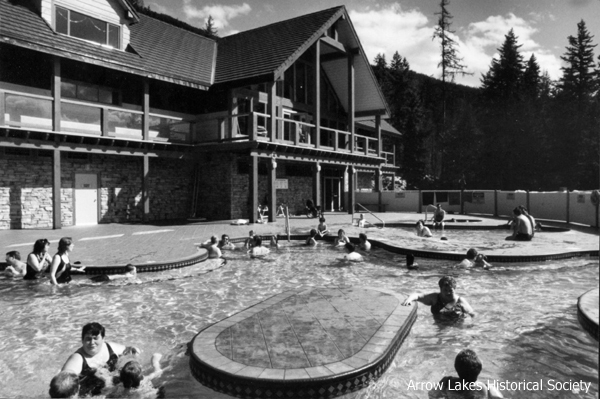 The springs itself remain a gathering place for people of all kinds from all walks of life. According to some sources, native peoples camped near the flow and dug earthen pools to soak in for the healing of the aged and infirm, while others hunted, fished, and gathered from the forest. Battles were fought over the springs whenever one group or tribe attempted to dominate or claim them. After one hostile encounter between the Kootenay and Colville tribes, chiefs negotiated a peace agreement, and to endorse it warriors fired many arrows into rock crevices by the lake, which were visible to the white men who later passed by. It is said this is how the Arrow Lakes received the name that endures to this day. It was a native who showed Capt. Robert Sanderson the springs. Sanderson was a university educated mechanical engineer who moved to the area in 1885. In 1888, he and others built the second steamship to ply the lake. Sanderson saw the value of the hot mineral water and in 1890 bought lot 100- 400 acres – from the Crown. That year he constructed a small building and wooden ‘plunges’ to soak in. He chose the name Halcyon, meaning calm and serene. On September 22, 1894, the official grand opening was celebrated pioneer style, with fiddles, dancing and feasting. In 1897, Sanderson and his new partner, Nathan Lay, sold Halcyon to Robert Brett and David McPherson for a little over $20,000. Brett and McPherson formed the Halcyon Hot Springs Sanitarium Co. Ltd., and proceeded to expand the facilities. The hotel was more than doubled in size, and cottages added behind it. A bottling works began shipping water to far destinations. The new owners were connected to the CPR and plans were laid to make Halcyon a world-class resort, one of five major attractions to be serviced by CPR steamship and rail. World War I changed things, however, and attention eventually shifted to Banff and Lake Louise. Under Brett and McPherson, Halcyon, though renowned always for its health-restoring waters, also became a posh place to party. A barroom located out of earshot from the hotel saw many all-night parties with heaving drinking and gambling. The hotel boasted all the latest conveniences and luxuries of its time, attracting everyone from the wealthy to the working class. Great balls were held with live music and fancy dress. Halcyon Hotel, set in the fresh wilderness of the mountains, was alive with adventurers, pioneers and travellers. Burnham rarely charged for his medical services, and because of the minimal revenue generated by the hotel, ended up doing much of the work of running it himself. Halcyon gained an international reputation as a place of healing. The bottling works shipped water everywhere, the Workman’s Compensation Board sent miners there to sweat out the lead metal. A room became filled with crutches and wheelchairs from people who no longer needed them when they left. Advertised to cure nervous and muscular disorders, liver, kidney and stomach ailments, Halcyon claimed to be the most complete health resort on the continent. Doctors and attendants were on hand at the pools. The Lithia content of the water is unsurpassed by any known spring, and besides being a natural relaxant, was thought to help purify the blood. One man who ran the general store at Halcyon claimed the water caused his hair to grow back. Over the years, quite a variety of animals were to be found at Halcyon, including caribou, monkeys, canaries, peacocks, chickens, goats, a pet bear, goldfish and a donkey. The pet bear cub, Joe, was the bear used on the bottled water label after he was given a bottle of it and promptly tipped it up and drained it! There was a thriving poultry business there for a while, supplying Halcyon and the CPR steamers. The goats were milked, the donkey pulled a cart from the dock to the hotel, and the goldfish added lively colour to the ponds. Besides the hotel, cottages, barroom, general store and bottling works, there was also a staff and laundry house, a boiler house, lawn tennis grounds and many trails. The trails around Halcyon were sometimes closed in the early morning, as General Burnham, to quote and old newspaper articles, “…runs naked on the trials to harden himself….” It seems that Burnham may have begun the clothing-optional tradition at Halcyon, for he allowed no bathing trunks in his pools, believing it interfered in the healing process. The two pools, of course, were segregated, male and female. The hotel changed little from 1824 to 1955. When his wife Anna died, the general built a small shrine beside her grave, his private chapel to rest and reflect in. Halcyon Hot Springs Hotel burned to the ground on February 19, 1955, taking the old general with it. Most of the other buildings survived, until the raising of the lakes in the 1960s. All that survived into the 1980s and 90s was the little chapel and the graves beside it. 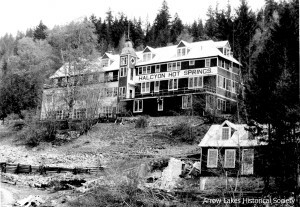 Beset by fire and water, Halcyon Hot Springs Hotel became dormant. The magic of Halcyon’s mineral water continued to make it a gathering place to soak away tension and aches and pains, even after the hotel was gone. Outdoor tubs were pieced together by many different users. Halcyon Hot Springs stands serene.